Miscellaneous | Autozine has been driving a Smart ForTwo as a company car for over a year now. During this time this clever little car really has lived up to its name: this is a very smart city car that offers a lot of advantages over conventional cars. 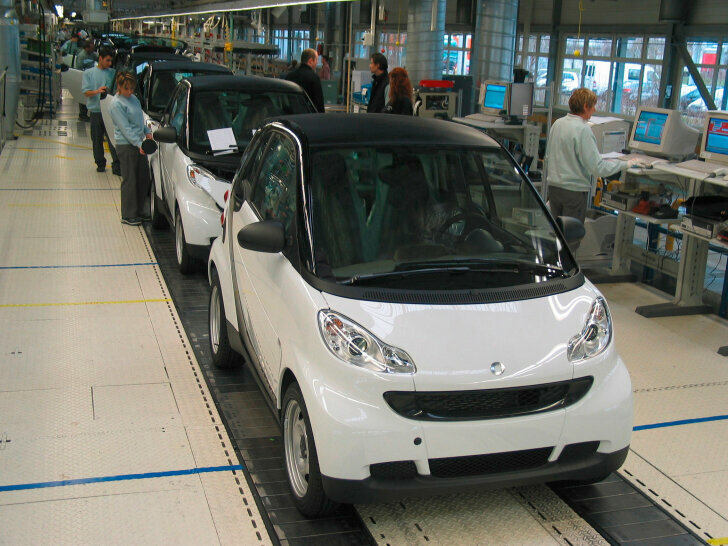 To find out how the ForTwo became so smart, the factory regularly organises tours for visitors. Autozine travelled to France where this smart little number started out life. Smarts enjoy their education in a modern village. The place is officially listed as "Hambach" and is located on the French/German border. But it is better known as "Smartville". And that name isn't an exaggeration: while most cars are build in a large plant, a Smart car is built by a group of factories which together form a village. Smartville measures 70 hectares, has 145,000 m2 of buildings and features its own high-speed test track. The location in Northern France is chosen because it is central to most major markets for Smart and that saves on distribution costs. Also, this remote area could use an economic boost because since the coal mines closed unemployment has been very high. Smart offers jobs to 1,600 people, of which half work directly at Smart and the other half for its auxiliary companies. The buildings of Smartville are arranged in the shape of a star. Each specialist has its own "arm" in which it builds part of the car. 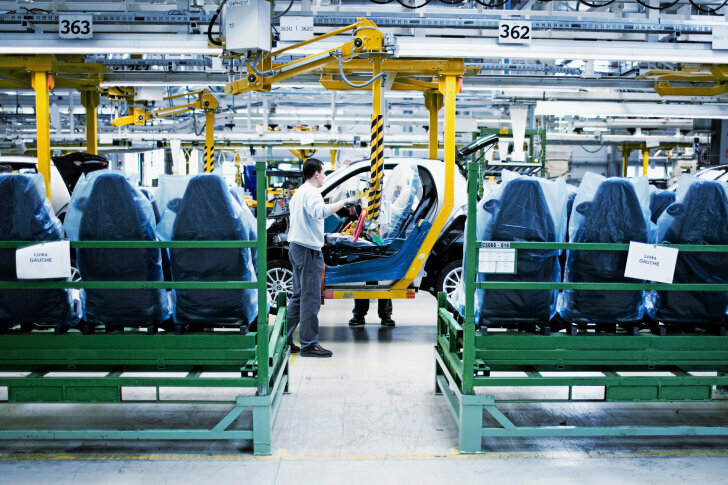 The centre of the star is where all parts come together and the Smart ForTwo is assembled. Because the factories work so closely together, all parts always arrive at exactly the right moment and in the right order. This avoids queueing and expensive warehouses. It all starts with a strong metal chassis, also known as the "Tridon safety cell". This is supplied by Magna (yes, the one from Vauxhall). Regular Smarts and convertibles are built on the same assembly line, but even from this early start it is obvious which car is being built. The Cabrio can be recognised by the roll bar behind the seats and the lack of beams over the doors. After the safety cell is protected by a coating of (powder) paint, the dashboard is installed. This is supplied by Continental, which is best known for its tyres. Now it becomes obvious how complicated building a car actually is. Just the interior can be executed in 5,000 different ways because of options and colour schemes. On the work floor merging the chassis and the dashboard is called the "engagement". After the engagement comes marriage, and that means merging engine and suspension with the safety cell and its dashboard. The diesel engines are supplied by Mercedes-Benz, the petrol engines come all the way from Japan and are built by Mitsubishi. Although the car doesn't have any body panels yet, the Brabus versions can now be recognised by the double exhaust pipes. The tyres, including the rims, are delivered in piles of four. Again the Brabus stands out because of its unusually wide tyres. The use of robots in Smartville is minimal; building a Smart ForTwo is mostly done by people assisted by cutsom-made tools that make the process run smoothly and efficiently. The largest building in Smartville is owned by Plastal. As the name suggests, this company produces the plastic panels that make the skin of the car. The doors are supplied two-by-two by a machine. 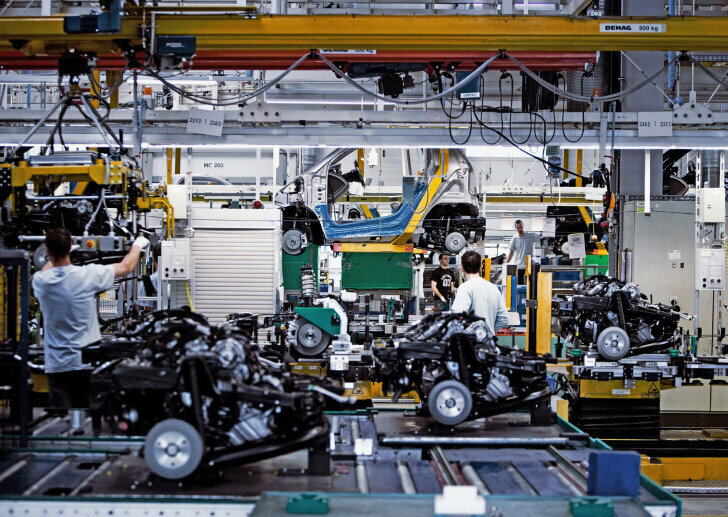 As soon as a worker fixes the left door, the machine elegantly swings over the production line and offers the other door to be fixed on the other side of the car. The bonnet and rear panels are easily clicked in place. This is why it is relatively simple to replace the panels later in life, in case of any damage or when it is simply time for a fresh new colour. 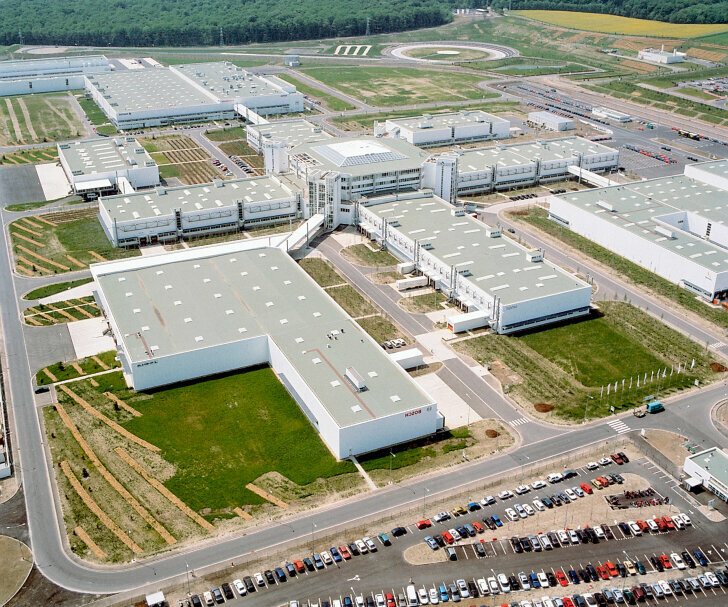 So called "Smart Art" cars (see for example the test of the striped Smart Brabus on this website) are not decorated in this factory. Artwork on the body panels is later applied by the dealer. This explains the high number of apparently bland cars on the production line: these are the ugly ducklings that have to wait a bit longer to become beautiful swans. Just three hours after the bare safety cell was supplied, the Smart ForTwo is ready to go. Cars that stay within Europe are filled with 3 litres of petrol. Cars that will travel by boat, are spoiled with 12 litres of fuel. The last step in the process is quality control. On a rolling road the engine and brakes are tested. In a wet cell the cars are checked for watertightness; this goes for all cars, not just the convertibles. Finally a visual check is carried out. If any problems are found, the car is separated and fixed by a specialist. All Smarts are built to order, the factory does not carry any stock. The number of cars produced strongly depends on the petrol price. When the price of fuel goes up, the demand for small cars does the same. On the day of the visit Smartville produced 526 Smarts, all of which are eagerly waiting to prove themselves in a city near you. Those who do not have a thing for Smart, have little reason to travel to the remote village of Hambach. In and around this rural place there isn't a single tourist attraction and even the scenery seems dull. But thanks to the Smart factory this region now knows economic prosperity and makes it a very interesting destination for Smart owners. Inside "Smartville" a number of factories work together to build the Smart ForTwo (the Smart ForFour was always built in The Netherlands, at NedCar). Although the way of building a Smart car doesn't differ much from building any other car, this plant does stand out because of its extreme efficiency. Auxiliary companies literally share the same space and therefore work perfectly together. All Smart drivers (and fans) are welcome during working hours for a tour around Smartville. However, a reservation is required; just visiting and buying a ticket isn't possible. In Smartville people do speak English, but French and German are the preferred languages. A visit to Smartville starts with the great feeling of being totally emerged in the world of Smart, as soon as you enter the 3-metre-only parking space. 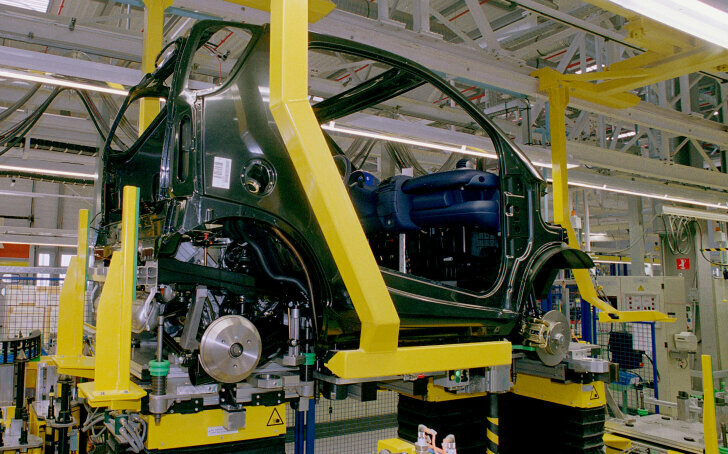 In the factory it becomes clear how a Smart is built and how this city car became so clever.